Preheat oven at 130oC for 15 minutes. Sift maida, cocoa powder, baking powder, baking soda and salt twice. Take a muffin tray and line it with paper cups or grease and dust individual cup moulds. Make powder of sugar using a mixer grinder. As preparations for frosting, sift icing sugar and cocoa powder separately. Take a mixing bowl and add unsalted butter which is kept at room temperature. Mix the butter with a spatula to cream it. Add sugar powder to the butter and cream it well. Add vanilla essence and mix well. Add half the sifted dry ingredients and 1/4cup milk and mix well. Then add the remaining sifted dry ingredients and 1/4cup milk and mix well. Add a teaspoon of milk at a time and mix to get dropping consistency batter---do not add more milk and that too at once. Divide the batter equally into the lined muffin mould or into greased and dusted individual cup cake moulds. See that each mould is just 2/3rds full---not more than that. Place the muffin tray or the cup cake moulds in preheated oven and bake at 130oC for 25 minutes or till done. Insert a toothpick and test the cakes once done. If the toothpick comes out clean then cakes are done and if batter is sticking to the toothpick then bake for few more minutes. Remove the cup cakes from the oven and let them be in the moulds for 5 minutes. Then transfer the cup cakes on to a wire rack and cool completely. While the cakes are cooling, make the frosting. Take butter into a mixing bowl and cream it. Add cocoa powder and cream well. Add half of icing sugar and mix well. Then add the remaining icing sugar and mix well. Add a tea spoon of milk at a time and make the frosting into a spreadable consistency. Fit a star nozzle into a piping bag or a piping jar and fill it with the prepared frosting. Place the piping bag or jar in a glass and keep it in refrigerator till use. Pipe the frosting starting at the centre of the cup cake and slowly pipe around till the cup cake is fully covered. Serve immediately. See that butter is at room temperature for easy mixing. Sifting the dry ingredients aerates the mixture. Also sifting would enable us to break any lumps in the mixture. To make cake flour, for every cup of maida, replace two table spoons of maida with corn flour. Cake flour makes more delicate cake however if maida alone is used then also it works well. For easier mixing, make powder of sugar before mixing with butter. If using salted butter avoid salt in the recipe. Salt adds a subtle flavor to the cup cakes. While adding milk, add it slowly in small quantities only. We need to make a smooth and homogeneous batter but not a running type batter. Fill only 2/3rds of the mould with batter as the cakes rise on baking. Preheating oven is very important before baking the cup cakes. As we add the raising agents in the batter, it requires proper temperature for baking. So after adding raising agents one should bake them immediately in preheated oven for good results. Cool the cakes completely before frosting. Use icing sugar while making frosting as it has some corn flour in it which helps in binding the frosting well. Add milk in very small quantity and mix as we do not want a runny frosting but a spreadable consistency frosting. While piping the cakes with frosting, pipe with confidence. Do not stop or give a break while piping frosting as it doesn’t give smooth and running finish. Once started do not stop piping till the cake is fully covered---then we get the rose shaped effect of frosting on each cup cake as shown in the picture. Make frosting ahead and fill it in piping bag and refrigerate and decorate just before serving. If frosting thickens, then add few drops of milk and mix and pipe it on cakes. If all the cakes are frosted, then we may need to refrigerate these frosted cakes to keep the frosting firm. Cold cakes would not taste that good---so it is advisable to keep cakes at room temperature and frosting in refrigerator and pipe the cakes just before serving. 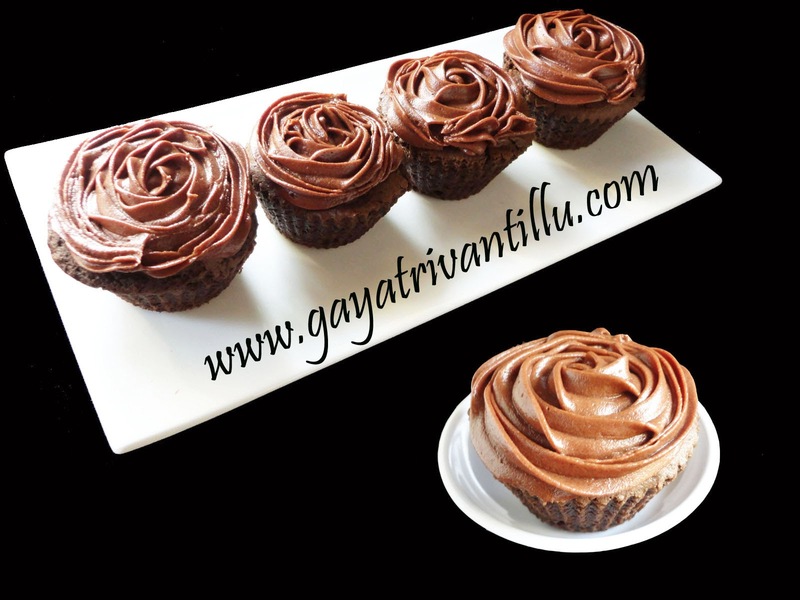 Make these eggless chocolate cup cakes with butter cream chocolate frosting in small batches as these cakes would not stay fresh for long period as milk is used in making them. The proportions given here would make around 8 to 9 cup cakes.